JV “Quartz” is a domestic (Russian) manufacturer of high quality quartz glass products. All products of our company comply with high European standards, which allows it to compete with products from leading American and European manufacturers. Offering an affordable price for our commodities, we are expanding the sales market, successfully cooperating not only with domestic but also with foreign buyers. The “Quartz” company, successfully works in the domestic market, developing the economy of our country. Partnership with us will allow you to make your own contribution to the development of economy. The main award for many years of successful work of our company is the respect and commitment of our customers. Choosing JV “Quartz” as a partner, you get reliable, profitable and long-term cooperation. Optical quartz glasses are mainly intended for manufacturing products in which one-sided light transmission is obligatory. Also they are used for rooms isolation, which requires protection from high temperatures to work in. Optical glass made of quartz is produced using a completely different technology than optical glass made from any other materials. This glass is a simple chemical composition, the only component of which is silica. The main characteristics are – high mechanical strength in a wide temperature range, absence of hygroscopicity, resistance to water and acid effects. Most optical glasses are produced in the form of feedworks, the size (diameter or diagonal) of which does not exceed 1200 mm. 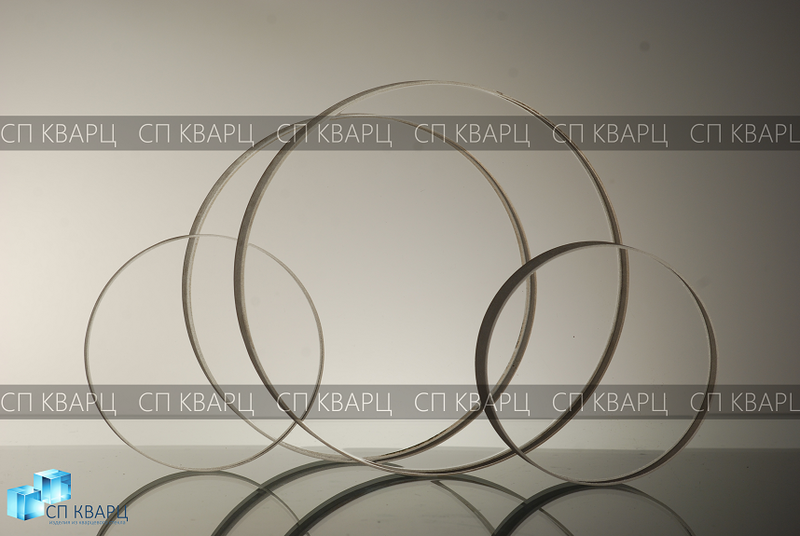 KU-1(GOST 15130-86 “Optical quartz glass”) The transmission spectrum of rays of this type is 170-250 nm. Resistant to radiation, does not luminesces. KU-2(GOST 15130-86 “Optical quartz glass”) Colorless and transparent in the visible part of the ultraviolet spectrum. Weak absorption band of waves with a length of 170-250 nm. Absorption band up to 2800 nm. KV(GOST 15130-86 “Optical quartz glass”) It is melted from the grains of natural quartz sand. It is made in the form of round (disks) and rectangular (plates) sheets. Mark KV is characterized by resistance to radiation and excellent uniformity of the material. CI(GOST15130-86 “Glass quartz optical”) Produced from quartz sand and chemical constituents. The length of the visible wave is 170-230 nm. Transparent and colorless. KUVI It is not luminescent, radiation-optically stable, transparent in the infrared, visible and ultraviolet spectral regions, glass with absorption intervals of 170-250 nm, 320-350 nm and 2600-2800 nm. Ordering optical quartz glass at “JV QUARTZ” company you can sure in the highest quality and short production terms. The quantity and size are preliminary agreed with the customers, and the order is made based on the technical characteristics and personal wishes of the customer. If you want to buy optical glass, you need to leave a request on our website. Our specialist will contact you to discuss all the details of yours following order.